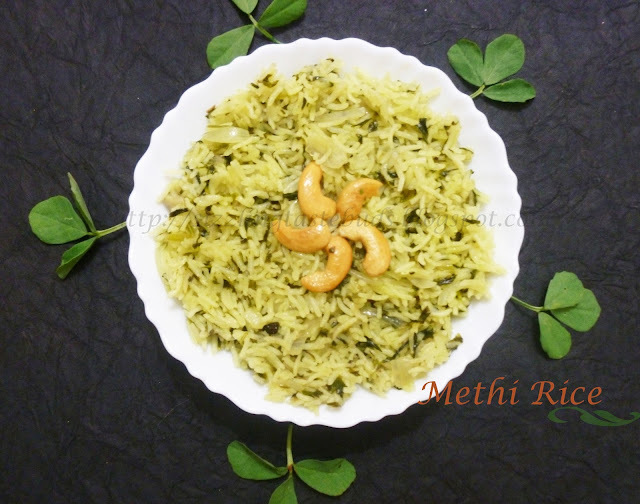 Methi Rice is a flavorful rice dish with a perfect blend of spices and a slight bitterness and aromatic fresh Fenugreek Leaves. 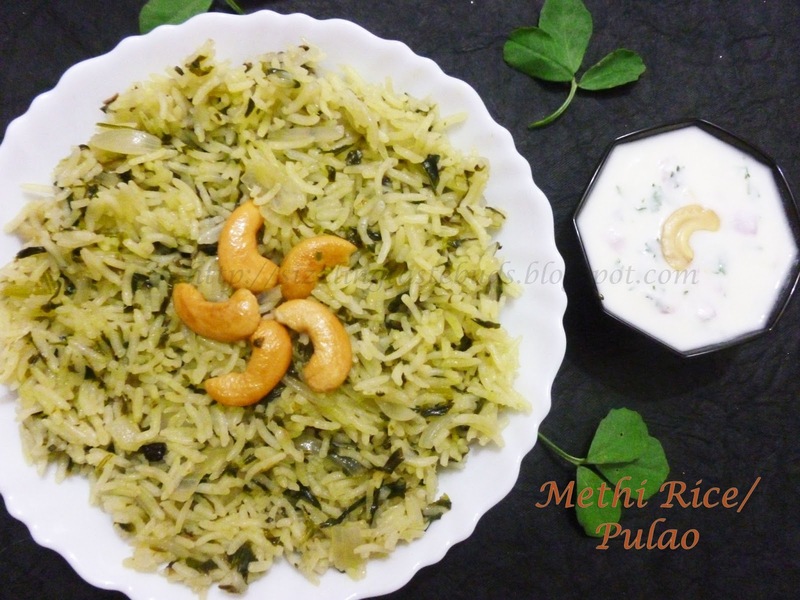 Its a very simple flavored rice dish which goes well with Onion Raita and some spicy semi dry or dry side dish like Spicy Chicken Tava Fry. The hard part in this dish is cleaning the leafy vegetable - Methi. Once that is done,cooking this flavorful rice doesnot take much time. This is a perfect dish to go into the lunch boxes. "Healthy bhi Tasty bhi! " 1. Clean the Methi( Fenugreek) leaves, wash it and chop it finely. Keep aside. 2. Wash and soak basmatic rice for 15-20 mins. 3. Heat 1 tbsp oil and 1 tbsp ghee in a cooker. Add some Cashewnuts and roast them. Remove them and save some for garnishing. 4. Now add Cinnamon stick, bayleaves, cloves and peppercorn. Saute it for a minute. 5. Add chopped oinions and slit green chillies. Fry till onions turns translucent. 6. Add Ginger- garlic paste and saute it for few seconds. 7. Now add the chopped fenugreek leaves and saute them till the leaves shrinks and gets half cooked. 8. Add 4 cups of water (for 2 cups of rice) and bring it to a boil. 9. Drain the water from the rice and add it to the cooker. Add salt to taste. Stir all once and then cover it with the cooker lid and allow it to cook for 1 whistle. 10. When done, mix once again gently and garnish with roasted Cashewnuts. Serve it with Onion Raita and some spicy Veg or Non-veg side dish. Cook the rice in a dum style as you cook for biryani's else cook it in a cooker for quick preparation. Adding 1 tbsp oil is optional. You can use 2 tbsp oil or 2 tbsp Ghee. I love Methi combinations both veg & non-veg. 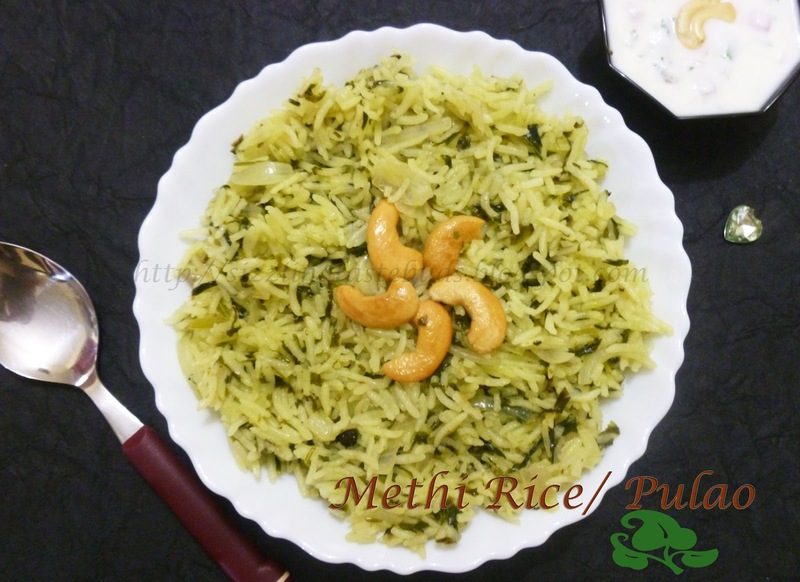 Frankly, Methi - rice is new for me....will give it a try this week-end !! Very delicious..I can feel the aroma with the look of the click! !